We simply have to watch money flow to know how “average investors” behave. Investor emotions typically run opposite to sound decision making. Sound allocation planning can provide other positive impacts on your overall plan. An emotional investor is very likely to make poor decisions over his or her financial life. Various experts (DALBAR, American College, etc.) have done in-depth studies to measure exactly how investor returns have lagged overall market performance. Measuring this behavior over an extended period for an “average investor” has proven difficult. The exact difference, in our opinion, is not as important as the undeniable trends in activity that occurs throughout full market cycles. The data tells us investors can be their own worst enemies. The chart[i] below measures mutual fund flows over what we would classify (at least) a full market cycle (2000 through 2010). Notice how buying and selling activity follows market momentum. The highest inflows (buys) came near the top of the Tech Bubble in 2000 and, conversely, the highest outflows (sales) happened at bottom of the market during the Financial Crisis in 2009. If we think about the most opportune time to invest in the last twenty years, you would be hard pressed to find a better time in March 2009. 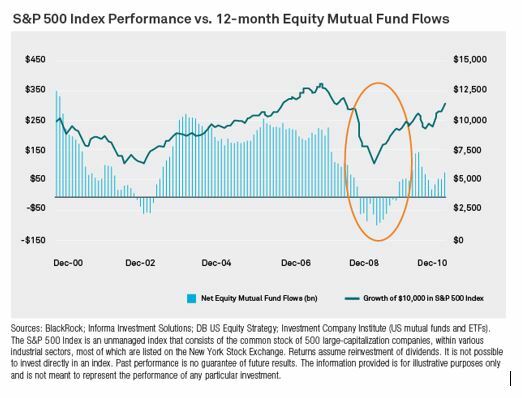 The chart below is one we reference from time to time both for our own consideration of a market lifecycle as well as with our clients when discussing behavioral finance. 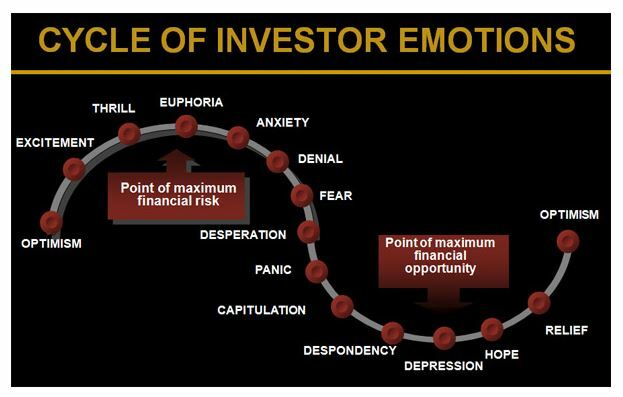 Think of the different emotions you have had as an investor at varying points along the cycle. Markets will push our emotions to motivate us to make the worst decisions at the worst times. It is fascinating how the two charts mimic each other in shape but more importantly the emotions experienced and purchase or sale activity motivated by said emotions. We believe the most effective approach to combat investor emotions is an asset allocation approach that avoids emotional decision making. According to Vanguard[ii], if we look at the return of a 60% Stock and 40% Bond portfolio, over the previous 90 years ending in 2017, an investor would have realized an annualized return of 8.8%. Not bad performance for not changing your allocation for over 90 years! This is often the most overlooked benefit of a fixed income or bond allocation. When talking with clients about dealing with market volatility, we point to the idea that we can pull a distribution from any asset at any time. By taking from fixed income in a bear market, we can avoid having to sell the equity portion, giving your stocks additional time to recover. By educating our clients to this approach, we believe we are empowering them to be patient in volatile market periods. I am always amused when someone tells me, with pride, that he sold during the financial crisis. What I rarely hear is when they sold and, more importantly, when they bought back in. Data tells us that the largest number of sales came during March 2009, the very bottom of the market during that period. The reality is, a “timing investor” has to know when to sell and when to buy back in. It is highly likely that those that sold in the trough of 2009 bought back in much higher, if at all. A rebalancing approach is a less risky way of attempting to time the markets by taking on incrementally higher positions in asset classes that have not performed as well. We look to rebalance portfolios to trim areas that have outperformed others but not as an attempt to time a short-term market period. Historically, more risk in a portfolio leads to higher investment returns over a long period of time versus a less risky portfolio. The problem is the increase in risk, usually defined by volatility or standard deviation, is not typically associated with an EQUAL increase in performance. At some point, you could be increasing risk and downside potential while only incrementally increasing your opportunity to the upside. We strive to find an allocation that we believe manages the client objective, balancing risk and return expectations. This is addressed in our last Atheneum on Asset Allocation, but the most important aspect of proper allocation selection is positioning yourself specific to your own risk tolerance and liquidity needs. As our clients get older and closer to needing income, it is critical that their asset allocation is appropriate for them and their needs. When markets have prolonged bull market stretches, we get a sense that many investors’ expectations rise accordingly. Conversely, people tend to expect less aftermarket pullbacks. This ebb and flow of expectations can wreak havoc on a financial plan. If you are an investor taking income or planning to over the next several years, benchmarking yourself solely against the overall stock market is a futile practice. Why would you compare yourself to the stock market if you are only partially invested in the stock market? We create blended indexes to more properly measure portfolio performance against a portfolio of similar holdings. Most sophisticated, institutional investors do the same. In conclusion, it is important that investors recognize the emotional pull that can come at various points in a market cycle. In our experience, the patient investor tends to perform best and only decides to make changes to his or her allocation when their own situation changes i.e. early retirement, inheritance, or business sale. Drastically modifying one’s allocation in reaction to market swings may feel natural but realize you may only be taking from your future self.